How high are the levels of food molecules in the soil? Would it be possible for a plant to evolve to take up these food molecules as its main source of energy? Have any plants evolved to do this partially? As well as this how big are these root hair cells and do swamp plants have them as there is no lack of water in swamps? There is not much “food” in soil and no plants take it up. There are animals such as earthworms that feed on detritus in soil but no plant as far as I know. 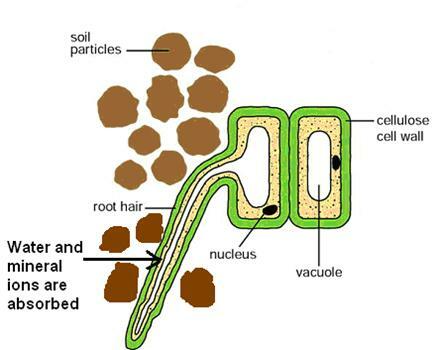 Swamp plants will still have root hair cells as they need the large surface area not just for water uptake but also to move minerals into the root. How exactly do the leaves “use” the mineral ions transported by the xylem vessels from the roots? And how do they convert these mineral ions into amino acids, chlorophyll, proteins etc.? Is it through some complex chemical equation, or are the mineral ions somehow connected with photosynthesis and the water in this process? This is quite a complicated question to answer. The mineral ions are used to make the organic molecules you mention but also using the carbohydrates made in photosynthesis. You cannot convert a mineral into an amino acid but you can use the nitrogen atoms in the nitrate ion together with a hydrocarbon skeleton to make complex organic molecules. Hope this helps…..
Is the movement against the concentration Gradient meaning the same thing as in diffusion, or the opposite. 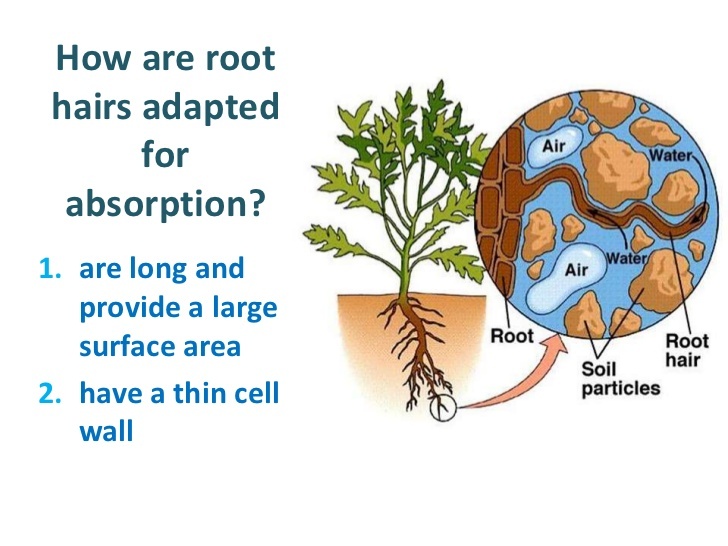 Also what are the cells that are not on the surface of a root called? Diffusion happens down a concentration gradient (high to low) so movement against the gradient is the exact opposite of diffusion. There are lots of other cells in the root. Most are a type of packing tissue in plants called parenchyma. How quickly does water move into the root hair cell through osmosis? Is it instant? Or does it take time for a significant amount to move in? It is hard to answer this. Water will be moving into root hair cells all the time there is a water potential gradient down which it can move….. So it is going on all the time. Do carnivorous take their mineral ions from the soil or their prey? If so how effectively in comparison to normal plants? Carnivorous plants tend to live in mineral-deficient soils. They use dead animals as a source of minerals such as nitrate/phosphate etc. But carnivorous plants still grow slowly and tend to be small. So this process can’t be as effective as a “normal” plant taking in minerals from a mineral-rich soil. As well as the main mineral ions described (nitrates phosphates e.t.c) what are the other ions without which the plant would die? And how do they enable normal photosynthesis/respiration e.t.c in the plant and does more than one mineral ion perform the same function in a plant? Some good questions. Other essential minerals are sodium, potassium, calcium, iron, chloride – there are many more. All play a variety of different roles in the plant cell metabolism and there isn’t space here to explain the details. I will give you one example. Iron is needed to build a n essential protein needed in mitochondria for respiration. In the desert where there is very little water, Is this still the only way by which plants can take in water? How long can they survive with no rainfall? Are there many mineral ions is the desert? Good questions. Some desert plans can take in water that condenses as dew. The mineral content is very low hence the low growth rates of all desert plants.